This nice autumny salad is a bit of a variation on the traditional Waldorf salad and it somehow suits this time of the year perfectly. It’s packed full of stuff that’s good for you – kale, apples and celery, with a dash of extra flavour in the form of salpico, nuts and raisins. You can’t really go wrong with any green, leafy veg but kale is a kind of superfood in its own class. It’s full of anti-oxidants, vitamins, minerals and fibre, and it even contains some protein and healthy fats. It helps to lower cholesterol, reduces the risk of cancer and supports the body’s detox processes. All that in a delicious salad, and if you can get your hands on organic kale, even better! And yes, you can cook it but it’s used raw here. Kale is quite strongly flavoured and can be a bit of an acquired taste but I love it (then again, I love all the bitter greens), especially the curly variety I’ve used here. If you haven’t had it before, this is a good way to try it as it’s mixed with quite a few other flavours. If you really don’t like it though, you can always substitute baby spinach (I actually often make a version with Swiss chard – baby spinach just has a milder taste) or even normal lettuce, although you’re then approaching a Waldorf salad again. For the topping, I used salpico, as a friend had kindly given me some, and it worked really well here. 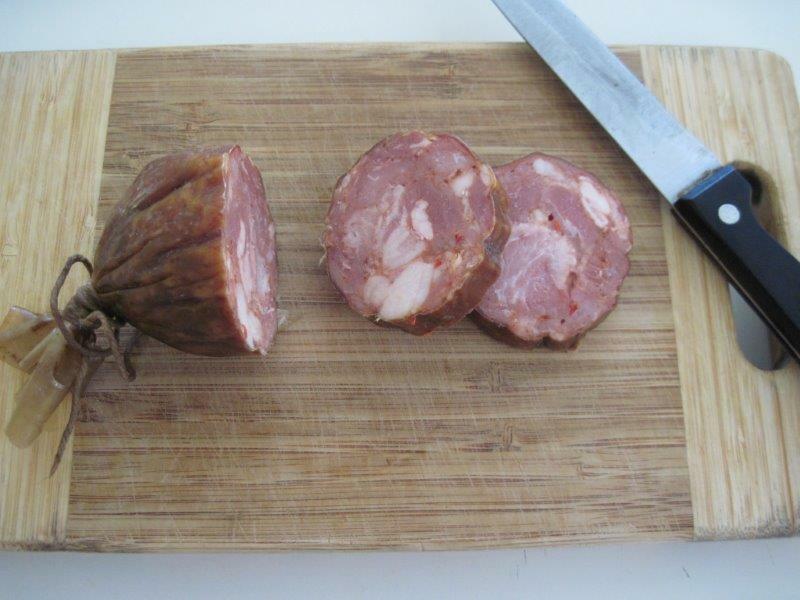 You could equally well use any kind of spicy sausage, like chorizo, or even bacon bits. Or if you don’t eat meat, you can just leave it out and add a few more nuts. 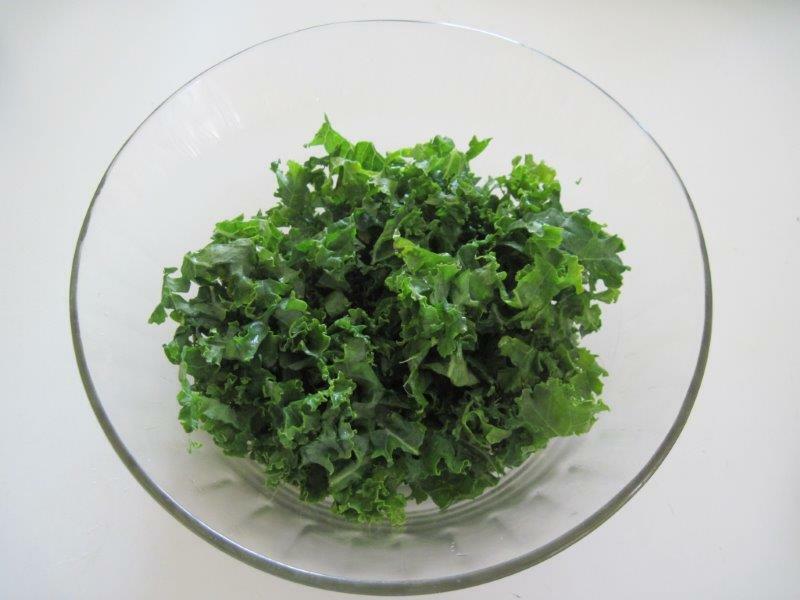 What you’re looking for is a salty and slightly chewy texture to offset the tartness of the kale. For the dressing, you could use plain olive oil and balsamic vinegar, or in fact just about any bottled dressing, if that’s your thing. 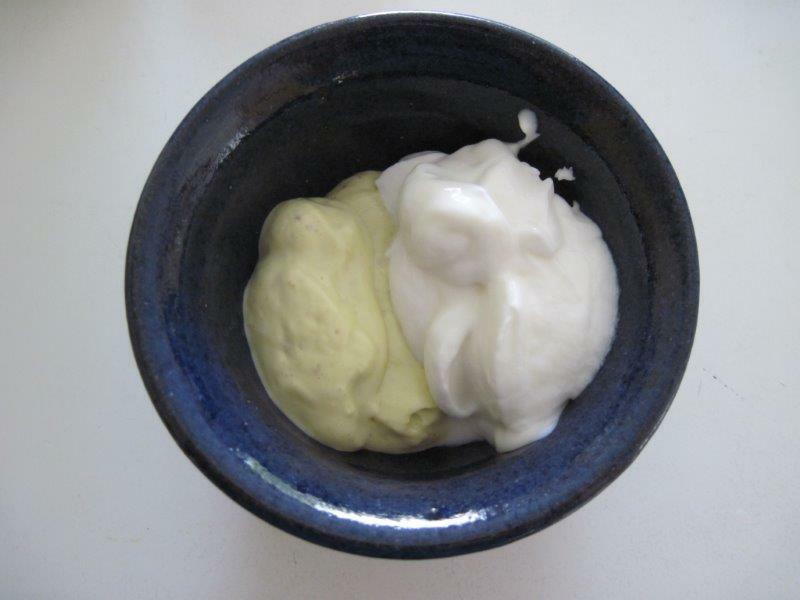 I like a mix of mayonnaise and yoghurt as it gives the whole thing a nice creamy taste (actually adding some avocado would also work and give a similar effect). If you make your own mayo and avoid using refined oils like sunflower or canola, it’s actually good for you. I make mine using a mix of macadamia and extra virgin olive oil, with a dash of mustard, garlic and quite a bit of lemon juice. And in case you’re worried about making it, this method couldn’t be easier and takes about a minute. The approximate quantities below make a salad that can qualify as a light meal for one, or as a side salad or starter for two. Feel free to add more or less of any ingredient to your taste. Then enjoy it, knowing your body is loving it too! 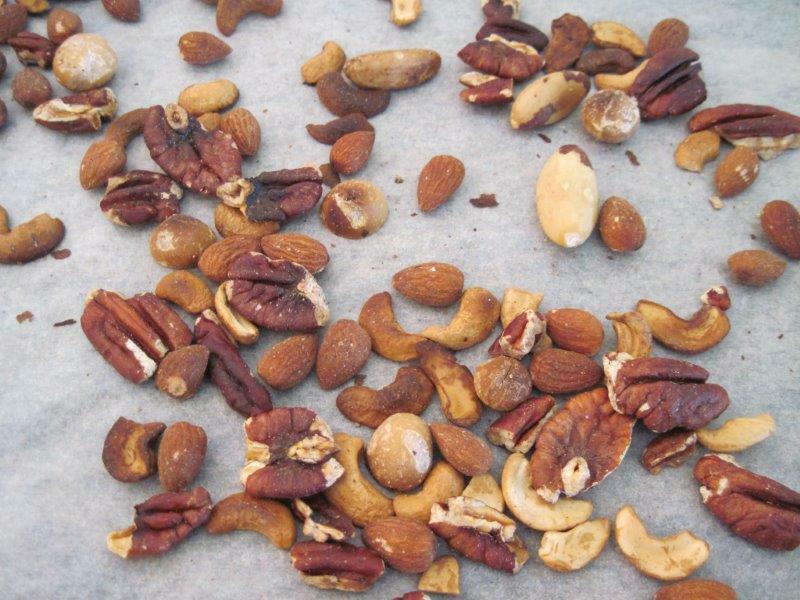 Heat the oven to about 180°C, and place the nuts on a baking tray. Bake for about 10 minutes until they’re just starting to brown. You could also toast them in a pan on the stove-top, although that requires more attention. Either way, be sure to watch them very carefully as they burn easily. When they’re ready, remove them from the oven and allow them to cool. 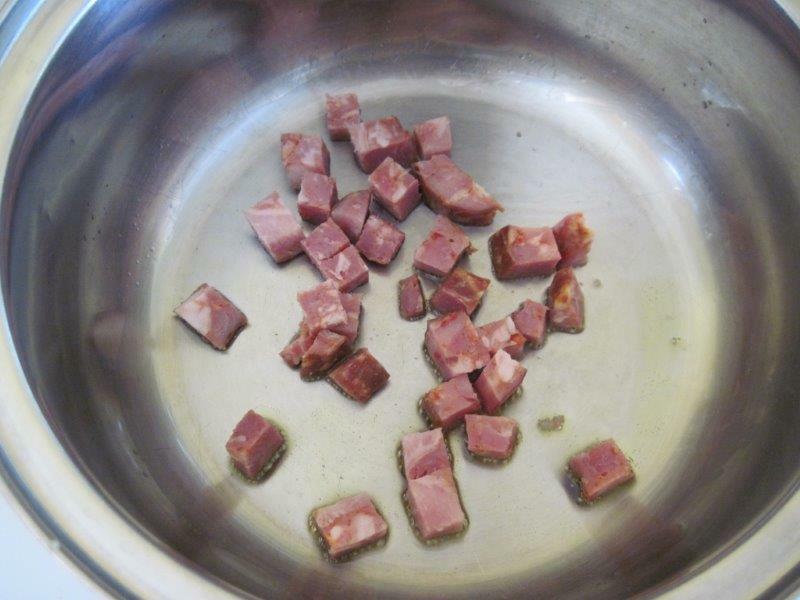 In the meantime, add just a dash of olive oil to a pan and while it’s heating up, chop up your spicy sausage. Add the chopped sausage to the pan on low heat. 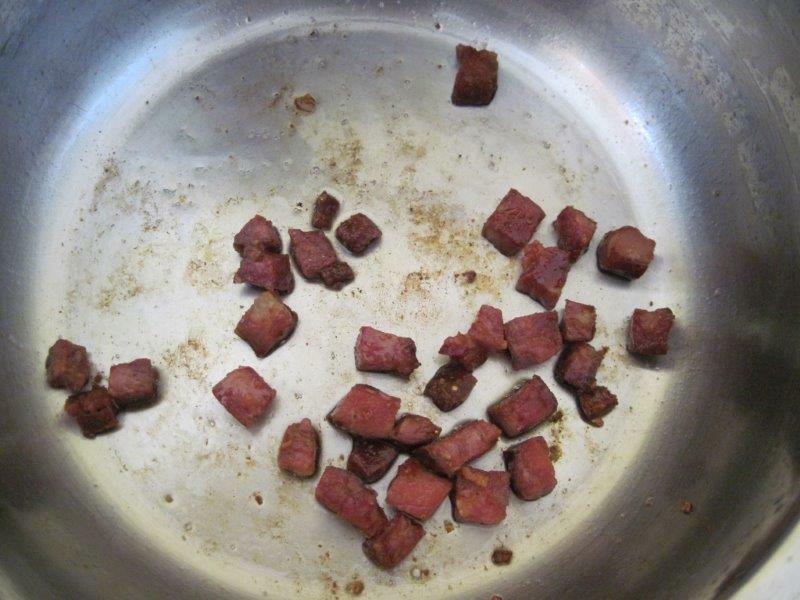 Cook, stirring often, until it’s crispy and lightly browned, which may take 5 – 10 minutes. Remove from the pan to cool slightly. Quite a bit of fat will have rendered out and if you like, you can put the sausage on a paper towel to soak up a bit more while it’s cooling. 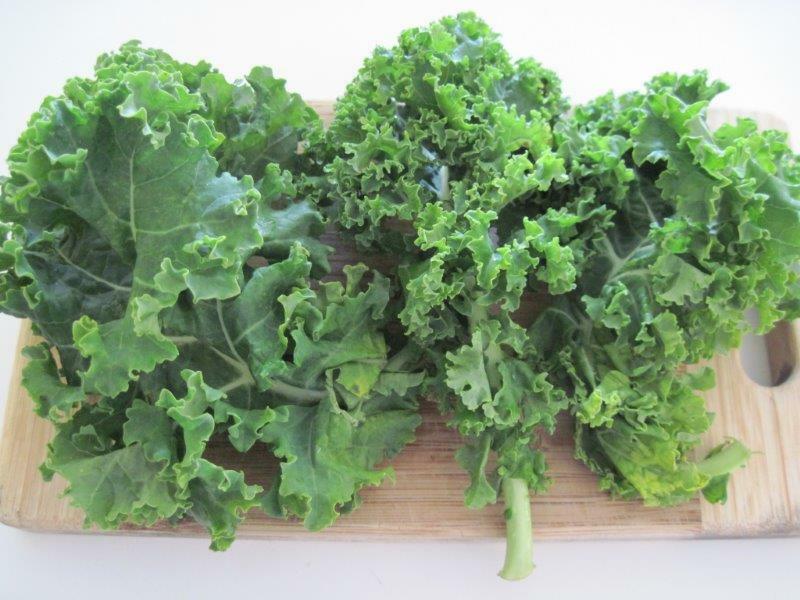 While that’s all busy cooking, wash your kale well and chop it up as small as you please. Place it in a serving bowl. 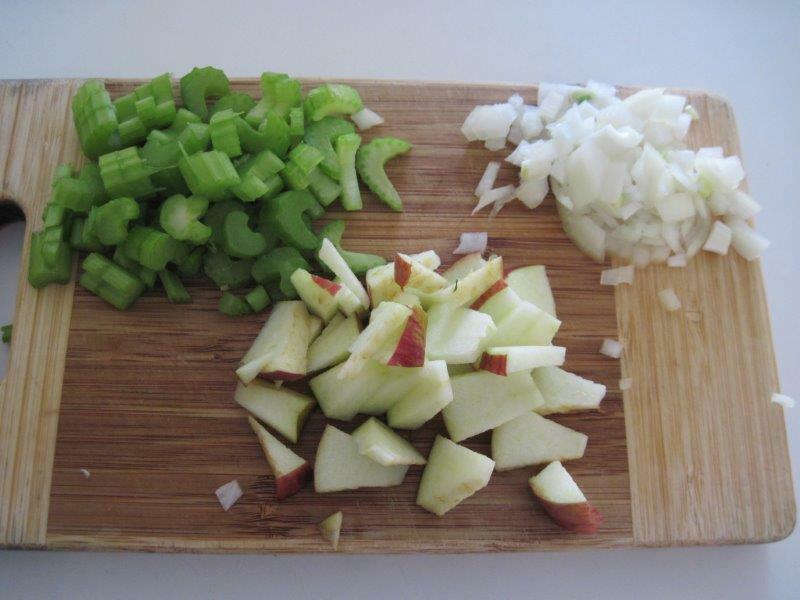 Also wash and chop the celery and apple, and peel and chop the onion. 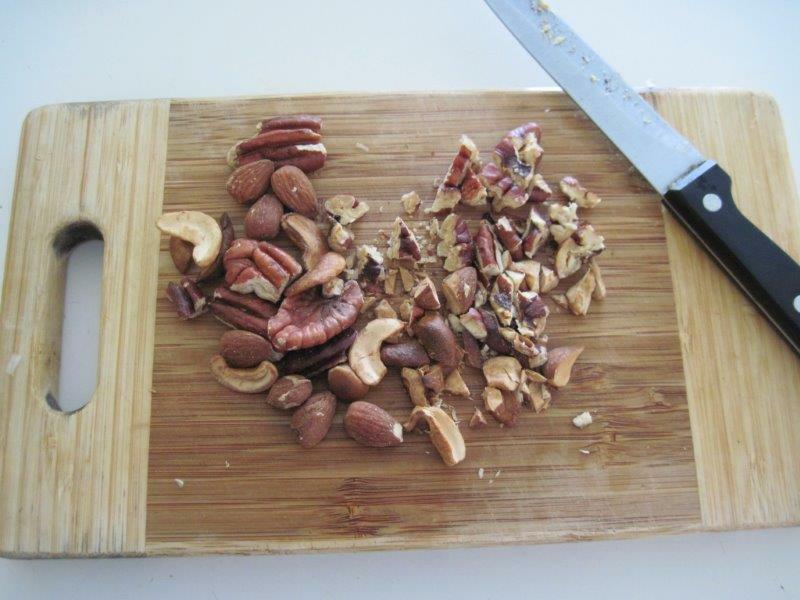 When the nuts are cool enough, chop them up too (or leave them whole if you prefer). 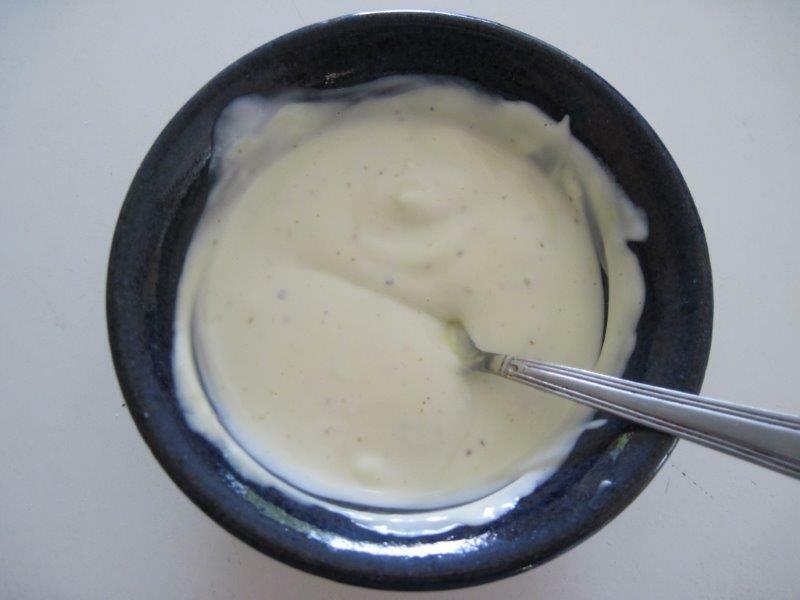 Mix the yoghurt and mayonnaise together. 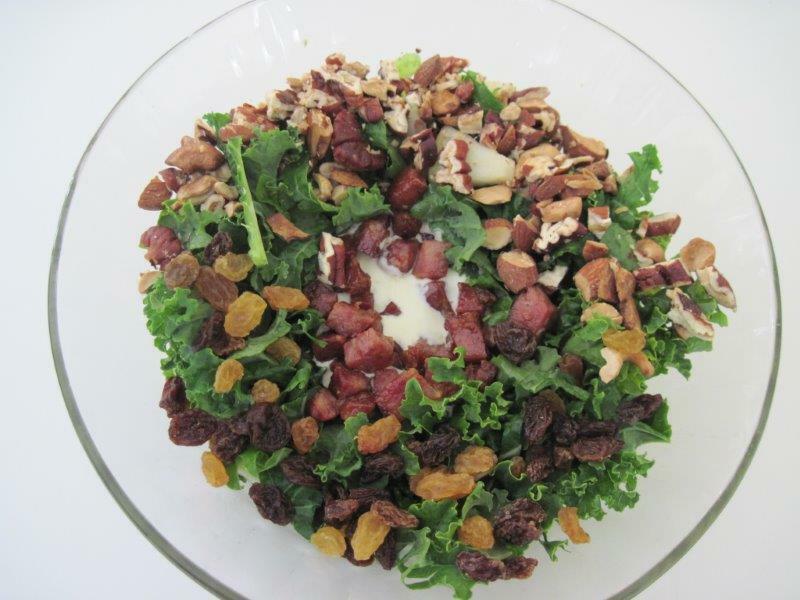 Now layer everything up on top of the kale, finishing with the nuts, sausage, raisins and finally the dressing. When you’re ready to serve, mix it all up well and eat immediately, while everything is still crispy. 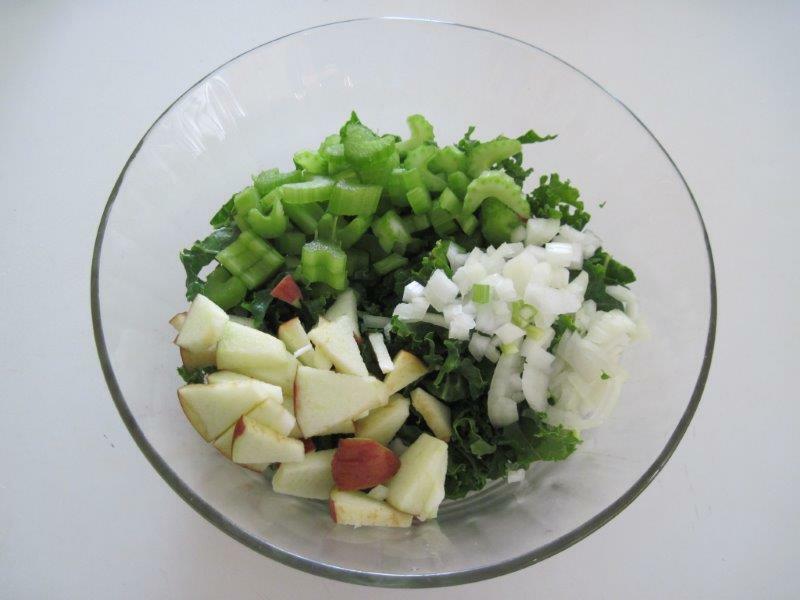 This is a definite to do as soon as I can – love kale! Will marry perfectly with chouriço – nyum!